Time lapse is always challenging… you’ve got a high resolution image sequence that can seriously tax your system. Add Flicker Free on top of that… where we’re analyzing up to 21 of those high resolution images… and you can really slow a system down. 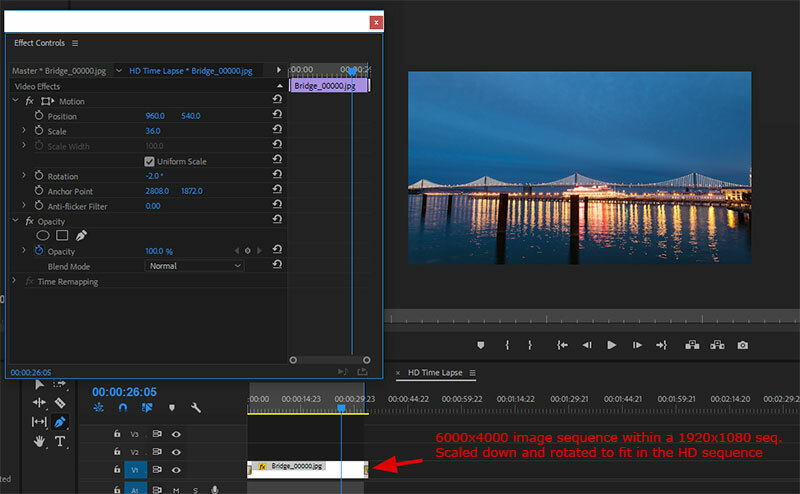 So I’m going to go over a few tips for speeding things up in Premiere or other video editor. First off, turn off Render Maximum Depth and Maximum Quality. Maximum Depth is not going to improve the render quality unless your image sequence is HDR and the format you’re saving it to supports 32-bit images. If it’s just a normal RAW or JPEG sequence, it won’t make much of a difference. Render Maximum Quality may make a bit of difference but it will likely be lost in whatever compression you use. Do a test or two to see if you can tell the difference (it does improve scaling) but I rarely can. RAW: If at all possible you should shoot your time lapses in RAW. There are some serious benefits which I go over in detailed in this video: Shooting RAW for Time Lapse. The main benefit is that Adobe Camera RAW automatically removes dead pixels. It’s a big f’ing deal and it’s awesome. HOWEVER… once you’ve processed them in Adobe Camera RAW, you should convert the image sequence to a movie or JPEG sequence (using very little compression). It will make processing the time lapse sequence (color correction, effects, deflickering, etc.) much, much faster. RAW is awesome for the first pass, after that it’ll just bog your system down. Nest, Pre-comp, Compound… whatever your video editing app calls it, use it. Don’t apply Flicker Free or other de-flickering software to the original, super-high resolution image sequence. Apply it to whatever your final render size is… HD, 4K, etc. Why? Say you have a 6000×4000 image sequence and you need to deliver an HD clip. 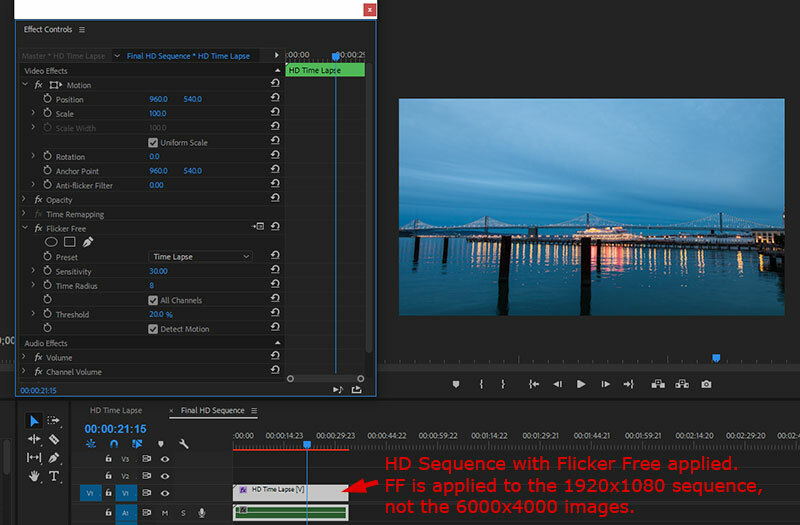 If you apply effects to the 6000×4000 sequence, Premiere will have to process TWELVE times the amount of pixels it would have to process if you applied it to HD resolution footage. 24 million pixels vs. 2 million pixels. This can result in a HUGE speed difference when it comes time to render. First, take your original image sequence (for example, 6000×4000 pixels) and put it into an HD sequence. Scale the original footage down to fit the HD sequence. The reason for this is that we want to control how Premiere applies Flicker Free. If we apply it to the 6000×4000 images, Premiere will apply FF and then scale the image sequence. That’s the order of operations. It doesn’t matter if Scale is set to 2%. Flicker Free (and any effect) will be applied to the full 6000×4000 image. So… we put the big, original images into an HD sequence and do any transformations (scaling, adjusting the position and rotating) here. This usually includes stabilization… although if you’re using Warp Stabilizer you can make a case for doing that to the HD sequence. That’s beyond the scope of this tutorial, but here’s a great tutorial on Warp Stabilizer and Time Lapse Sequences. Next, we take our HD time lapse sequence and put that inside a different HD sequence. You can do this manually or use the Nest command. Now we apply Flicker Free to our HD time lapse sequence. That way FF will only have to process the 1920×1080 frames. The original 6000×4000 images are hidden in the HD sequence. To Flicker Free it just looks like HD footage. Those should all help your rendering times. Flicker Free still takes some time to render, none of the above will make it real time. However, it should speed things up and make the render times more manageable if you’re finding them to be really excessive. Flicker Free is available for Premiere Pro, After Effects, Final Cut Pro, Avid, Resolve, and Assimilate Scratch. It costs $149. You can download a free trial of Flicker Free here. Should be done by NAB. Turning out to be more difficult than expected and we also got distracted by Transcriptive. But it’s super high on the priority list, so it’s coming.